The Dremel Multi-Max MM20 presents DIYers the professional oscillating tool performance theyve come to expect. With higher performance and productivity than the original Multi-Max 6300, the MM20 is capable of handling all the applications the 6300 can and more. The MM20 is a solid-performing and comfortably-operating oscillating tool from the brand you trust. Hook & Loop Pad The MM14 Hook and Loop pad accessory allows the Multi-Max oscillating tool to accept sand paper and diamond paper. Featuring a Quick-Fit design that allows for fast accessory changes, the MM14 is compatible with all Dremel Multi-Max tools including the Multi-Max model MM40 with the Quick Lock accessory change feature. Hook & Loop Pad is rated 2.3 out of 5 by 32. Rated 1 out of 5 by squig from Tool works great but the sanding pad melts QUICKLY I would love to give this 5 Stars as the concept of the tool overall is awesome. I work with wood all of the time in home projects and crafts on a daily basis. I've used lots of handtools over the years. To say the least, the execution of the pad quality is very poor, at least the glue which holds the velcro to the pad. I used the sander ONCE and after about 5 minutes of use using a coarse grit, the sandpaper came off. When I went to put it back onto the loop pad, I noticed about 1/3 of the pad was melted. I cannot affix a any new sanding pads to the unit. I know replacements can be bought for around $7.50 but I'm not looking to buy another piece which will work for 1 use. Unfortunately, because of this faulty product, I 100% would not cannot recommend buying one. Rated 2 out of 5 by OLuckyJ from mm11 or mm14 hook and loop pad velcro pad comes unglued as the heat from the friction liquefies the adhesive for the velcro pad. Even light pressure helps, but eventually result remains the same. I too, am surprised at the lack of availability and endurance for this part. Rated 1 out of 5 by luckytex from wears out and melts I like the product and performance, the pad just wore out very quickly and now I cant find a replacement in stores or online. Rated 1 out of 5 by jackline from pad wore away after few uses As the title suggests - i am very disappointed with this accessory - it came apart after a few uses - i still have most of the original sandpaper refills - very poor design. also, i cannot find on retail shelves. Rated 2 out of 5 by Familyhandyman84 from Handy tool, but doesn't last. 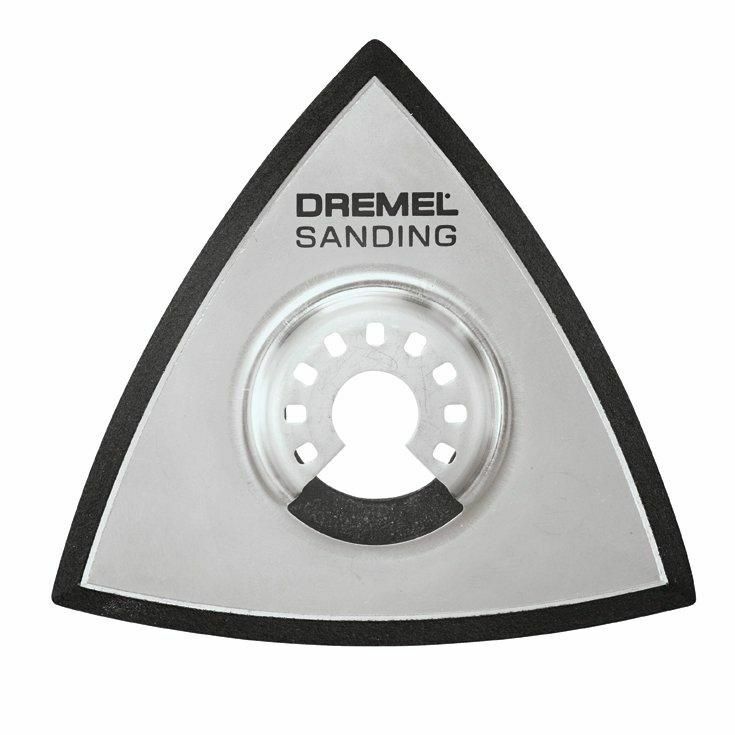 I really like the sanding pad and the ability to use it on my dremel tool. I have owned two of these pads and both have torn apart while changing sanding disc. The second one did not last as long as the first one. I have used several pads like this one in other applications and they have held up much better. I can only hope that they will improve them for future use. Rated 1 out of 5 by ChrisB from weare and tear I used this for a little bit and the pad fell apart very early, this is a great concept but you guys just need to make a better pad. Rated 3 out of 5 by AL from Use your Dremel on setting 4 or less. Otherwise you will eat through hook/loops and sanding pads at an alarming rate. Not durable when Dremel is set above level 4. The hook/lap and pads will be eaten at an alarming rate.